Necessity may be the mother of invention, but immediate necessity is the mother of rush purchases. My band was asked to perform a parade gig (back of a stake bed truck) and we were to provide our own audio. Since we usually play clubs with their own house system, and rehearse with modest needs, we found ourselves in need. Hence, the rush purchase of the Alto ZMX 122FX. To be honest, I was unfamiliar with Alto, and the lack of do-re-me was my prime motivator in making the purchase at the big chain music store whose name needs no further introduction. But, in terms of my needs and my budget…not to mention I needed it right now…my choice was limited to stock on hand: so, Alto. My needs were simple, and the Alto ZMX122fx fit the bill with a little extra to spare. I need a pair of XLR input for my singers, a XLR for the kick drum and another for an overhead condenser, and two ¼” inputs one for my guitar direct out, and another for the bass. 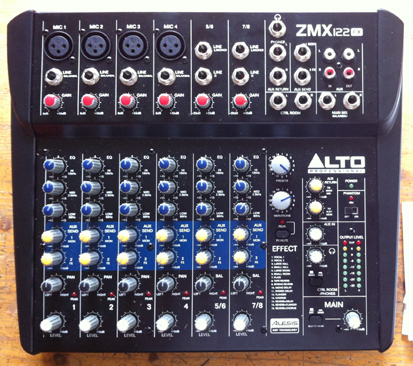 The Alto design, very similar to the landmark Mackie 1202 mixer, has my required four XLR channels (with switchable phantom power) and two addition stereo channels that can also be used as mono channels each with their own independent gain control in addition to the level (volume) control. So, right there, that’s great: the pre-amp can be calibrated to the signal. There’s also three band of EQ (that like the Mackie 1202: hit the key frequencies of 12k Hz for the highs, 2.5k Hz on the mids, and 80 Hz for the lows), a LED peak indicator, pan control and two aux sends. Part of the good part, is that Aux 2, if not otherwise interrupted, runs into a built-in digital effects unit that uses Alesis DSP technology. So, cool: built in reverb and other effects. So, in conventional use, where Aux 2 is driving effects; Aux 1 can be used to drive monitors…and, yes, the Aux 2 effects can be routed internally to Aux 1: reverb in the monitors…as so often requested. Hooking up the monitors was not quite as intuitive as I thought. Well, let’s just say I was confused. I was under the assumption that there would be a master control for the Aux 1 output (perhaps as the “Control Room” volume control), and I had tried numerous times to drive what I thought was a master output to my powered monitors to no avail. Only after visiting Alto website and viewing their demo video where a image showing their monitor routing showed that the Aux 1 send was to function as the source to drive the monitors. There is no master control, but rather the individual Aux 1 controls were to drive the monitor. Confusing, but now that I know, it seems functional: after all, it is likely that only one input would be causing the monitors to feed back. So, “Control Room” functions best as a home studio function where your mains are used to feed an external mixdown recorder and “Control Room” lets you adjust your monitor volume without messing up your mixdown volume. Maybe not ultimate with today’s computer recorders (there’s no USB or otherwise computer connectivity on the Alto ZMX122fx) but for those using a stand alone digital recorder hooking this up between your machine and the monitors might help you from being evicted. For those that do computer record, the ZMX122fx could be used to drive input of the M Box and other similar 2 track devices to increase your inputs to 8…however these would be 2 stereo tracks, and not eight independents ones. Other features include a master parameter control for the built-in effects (16 effects with 16 variations), a pair of RCA Aux in and outs (cool, but add to the Aux send/return confusion), headphone output (which is controlled by the “Control Room”) volume control. What is also cool, especially for the singer/songwriter or band on the run, is that there is a switch (also optional footswitch controllable) for the effects, so dialog between songs does not need to be drenched with effects that work well with the music (but not so well when trying to converse with the audience). 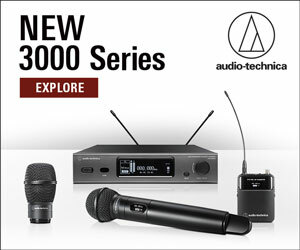 There are no XLR outputs, but the main outputs are ¼” TRS, balanced/unbalanced outputs that can be used with either standard ¼” semi-pro connectors or ¼” TRS to XLR adaptors for more professional use. While folded metal is used the top, bottom, back and front panel, plastic is used for the side panels. More importantly, the extend knobs of each of the controls, have shafts made of plastic, meaning at some point they will be broken off. 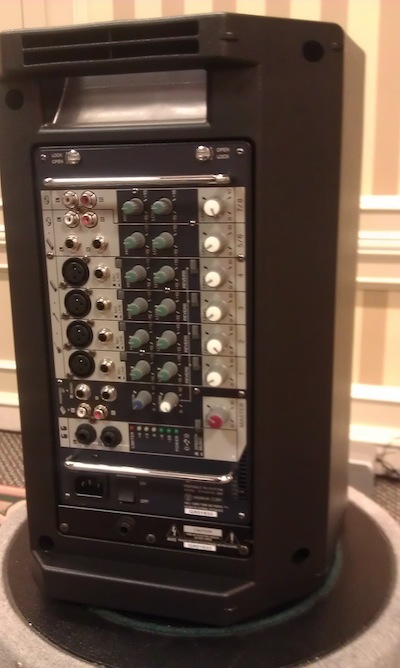 This is a console that needs to be protected, or sheltered in some way, otherwise your cost effective purchase will become rendered less effective or useless…say should a round base mic stand roll over it in the back of the van. However, with proper care, the pre-amps sound pleasing, the tone controls are true and allow easy dialing in the optimum sound, the effects are free of the usual rasp in units that cost more than this board. At the price ($219.00 list, $119.00 Street), it is a bargain…and in a pinch priceless. How much more you get out of the minimal investment depends on whether you gig or not, and how much care of take it in between them. UPROAR HITS A HOMERUN OF A TOUR!